QueryStorm exposes tables as collections of strongly typed objects, allowing you to easily query and modify data inside them using C# and LINQ. In case you prefer video, check out this introduction video. The examples in this document use a public dataset about salaries in the public sector in San Francisco. 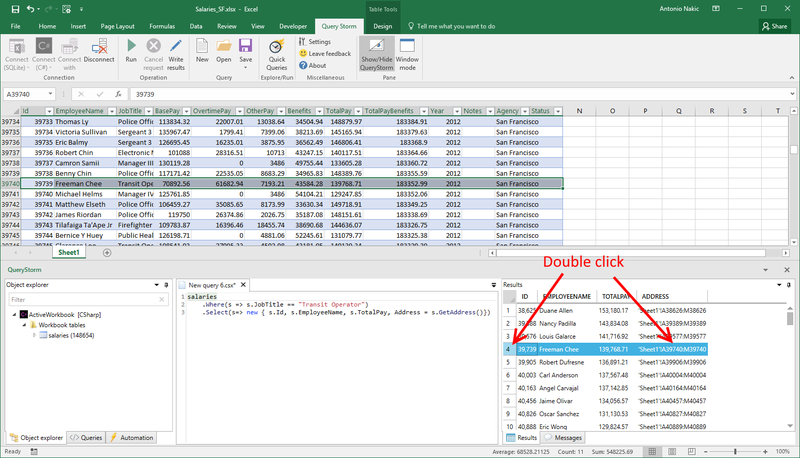 Once connected, Excel tables show up in the object explorer and are available to your scripts as variables. Each table is a collection of strongly typed rows. The row types are generated dynamically. In this example, there's only one table: salaries. Table columns in Excel can have names that are not legal C# identifiers. Property names are based on the column headers but are normalized in order to be legal C# identifiers: non-alphanumeric characters are removed, names that start with a number are prefixed with an underscore. In the results grid, column names will show up with their original names because the generated properties have a [System.ComponentModel.DisplayName] attribute applied. You can also access properties via indexer, e.g. row["Job Tilte"]. The return type of the indexer is dynamic. 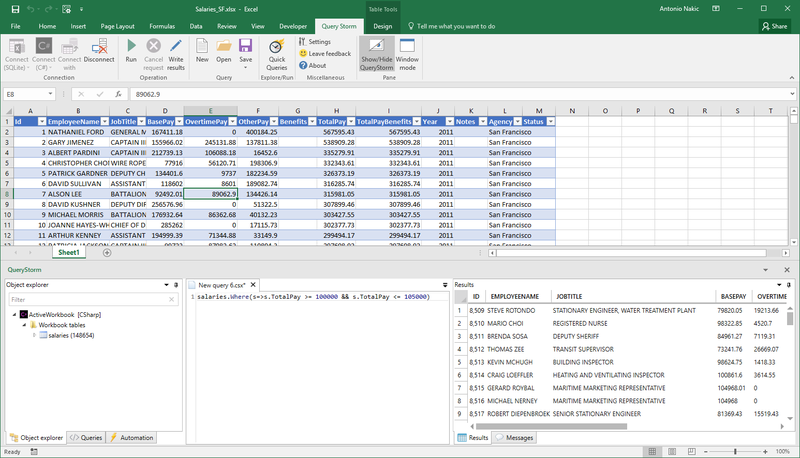 In order to find a particular row in Excel, we can include the row address in the results. Each row has a GetAddress() method that can be used to find the row in Excel. GetAddress() is a method rather than a property solely to avoid a naming collision in cases where a table has a column named Address. Let's find people with the job title "Transit Operator" in Excel. Once we have the address in the results, we can double-click the address cell OR the row header to navigate to the row in Excel. If there is no address in the results, double-clicking the row header will have no effect. The Insert method is strongly typed, but all of its arguments are optional, allowing you to skip the ones where null should be inserted (as well as calculated columns). The scripting flavor of C# is supported by Roslyn (the C# compiler) and is slightly different from regular C#. Most normal C# syntax is also valid in scripts, but scripts also allow a more relaxed syntax where you can evaluate expressions, without all the ceremony of defining types and methods. Under the hood, Roslyn preprocesses scripts and turns them into regular C# before compiling to IL. We didn't need to define a class and Main method. We didn't need an explicit return statement, either. The last statement in the script is assumed to be an expression that needs to be evaluated and returned, unless it is terminated with a semicolon. Closing an expression with a semicolon, however, hides the output. These expansions to the C# syntax are provided by Roslyn (not QueryStorm). For more on referencing scripts and libraries, click here.